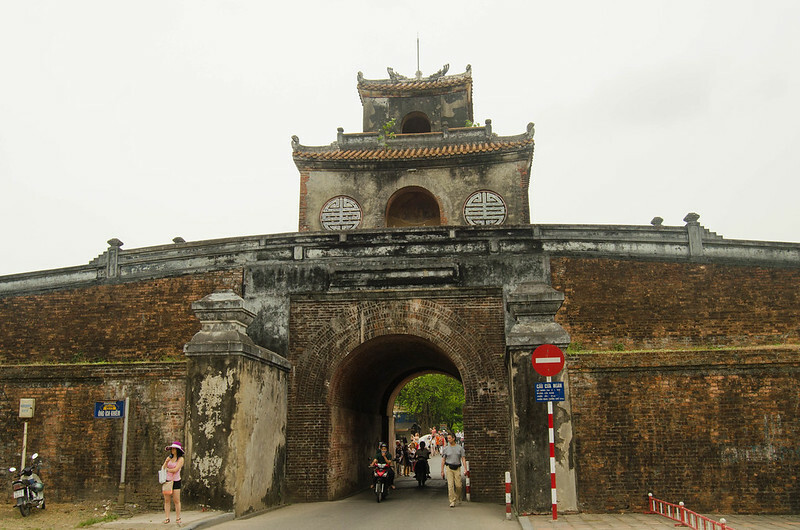 Hue was made the capital of Vietnam in 1802 during the feudal dynasties that ruled the country. 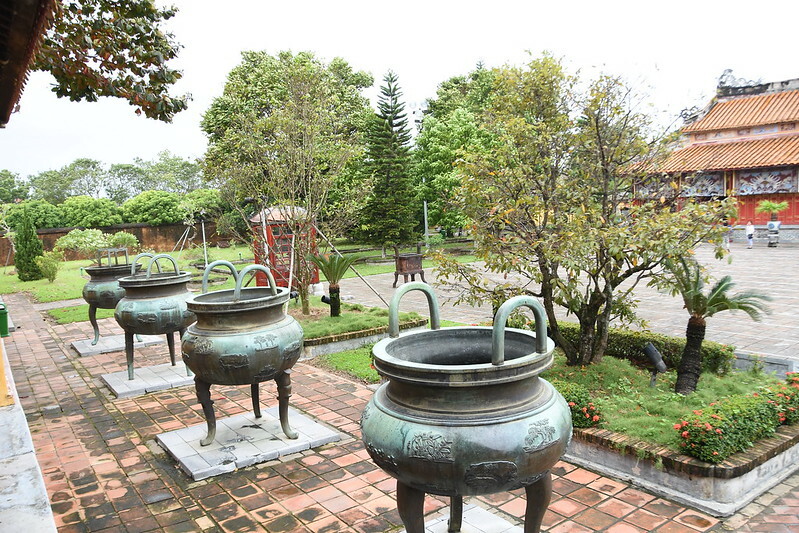 Nowadays, hundreds of historical relic sites remain in the city and are well worth our visit. It was a very hot and rainy day when we got there, so we spent a big part of it in a cafe by the river waiting for a thunder storm to pass. There was a distinctive earthy scent from the rainfall and the view was stunning: a bridge over Perfume river with the Imperial City as the background. 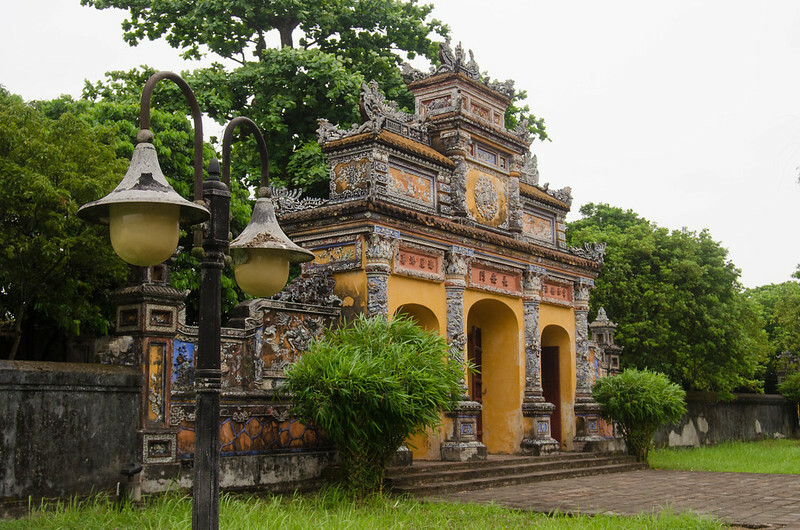 For a Vietnamese standard, Hue can be considered somewhat of a “calmer city”. 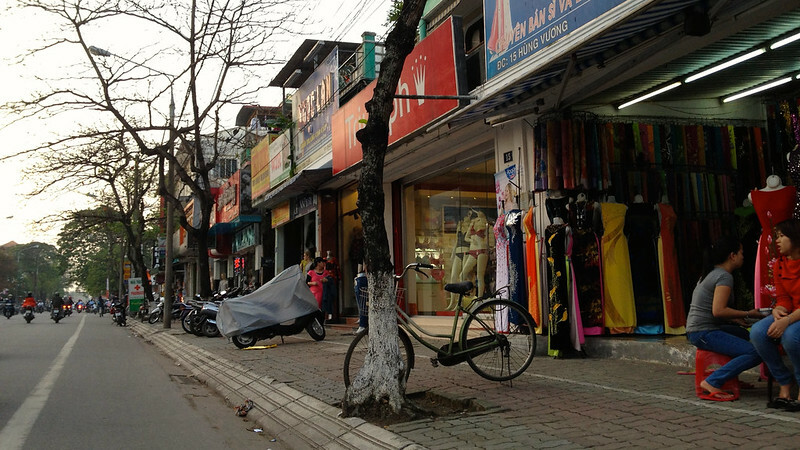 For quite a few times we found ourselves walking and eating alone ̶ something that never happened around Hanoi, Saigon or Hoi An. 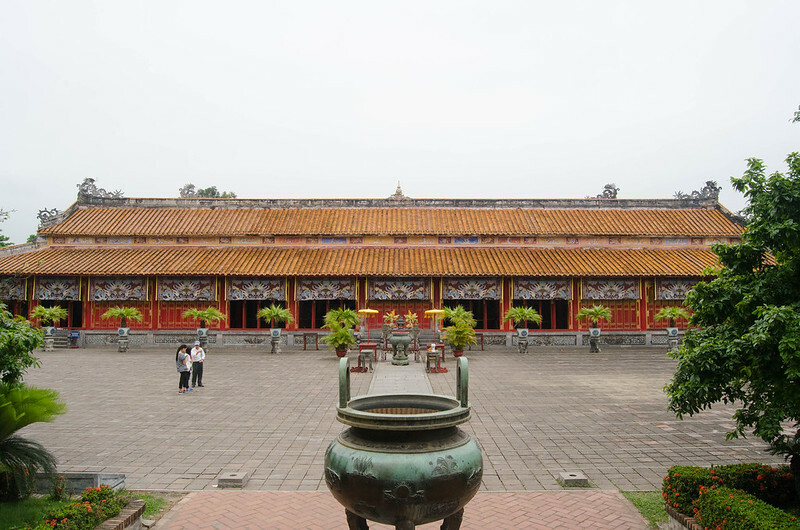 We stayed at the Ngoc Binh hotel not far from the Imperial City (approximately a 25 minute walk from the main entrance). Our room had a private bathroom, tv and included breakfast. Also, for one more dollar you could have AC in the room. If you’re interested, check the hotel here. The Citadel opening hours are 8:00 to 17:30. For a proper visit, you’ll need at least 4 hours. The entrance fee was 6.05€ for each of us. You’ll find two different prices: one for locals and other for foreign tourists. Locals pay less of course. 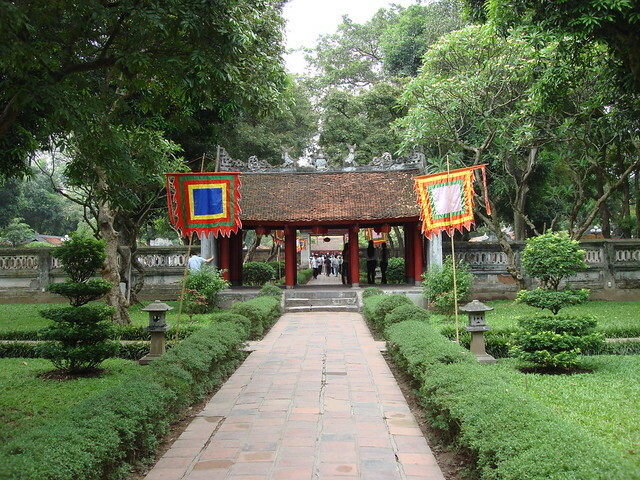 However, it was the first time we saw this price distinction at a Vietnamese monument ̶ at least in a noticeable way. As we slowly walked through the central entrance in the Ngo Mon Gate to shelter ourselves from the rain that showed up that morning, our heads turned towards a young couple speaking in Portuguese. There’s where we met Adriana and Diogo with whom we spent the rest of the visit. The Citadel was made a UNESCO site in 1993, and is going through gradual reconstruction and restoration, as many of the buildings were destroyed by bombings from the war against the French (1947), the Americans (1968) and some typhoons. There are countless walls and gates separating the different areas. 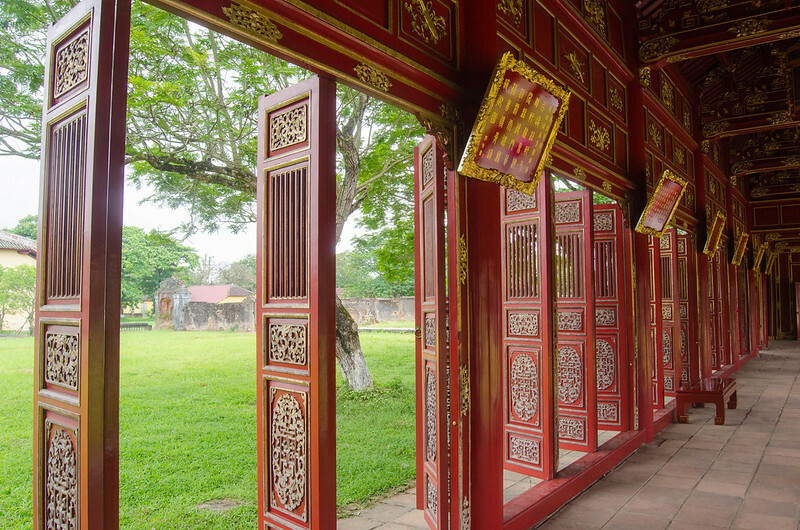 We started the visit by the regal and colorful Thai Hoa Palace where major royal receptions and ceremonies were held. Here’s where you’ll find most tourists hanging out, but also a ton of information on the history and architecture of the citadel. 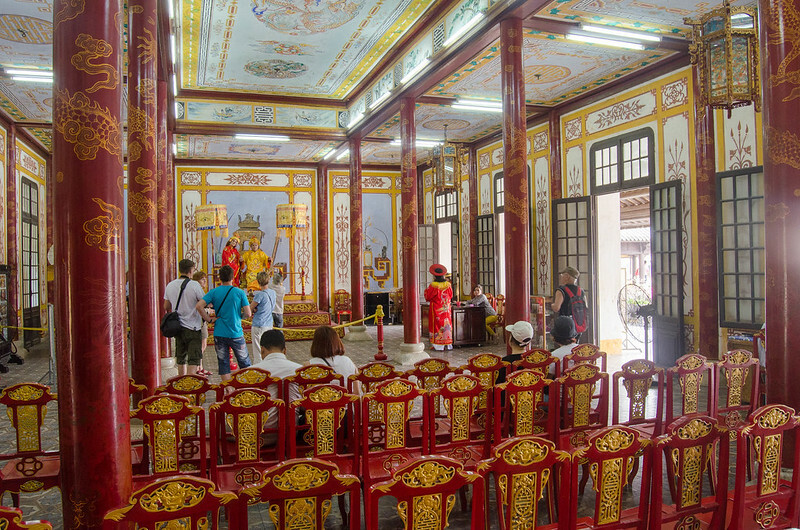 For the real touristy-tourists, you can dress in kitschy imperial clothes, sit on a throne and get your picture taken. After walking outside for a while, we reached the Royal Theater. 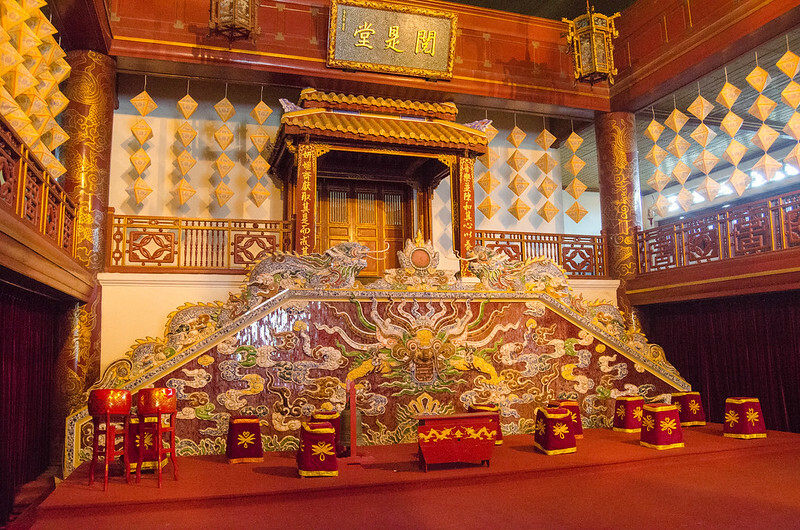 The building was reconstructed and now houses cultural performances like opera and royal dances, as well as a permanent exhibition with traditional theater costumes, masks and instruments. 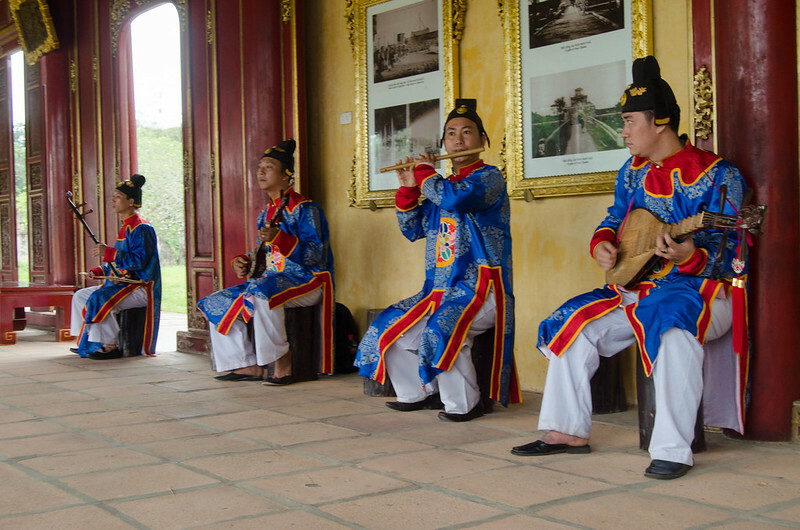 Even though we didn’t watch any show at the theater, we were lucky enough to listen to a live performance on the Hall of Mandarins, by a group of musicians playing traditional instruments. By now it was lunchtime and inside the complex, we couldn’t find anything to eat besides snacks. 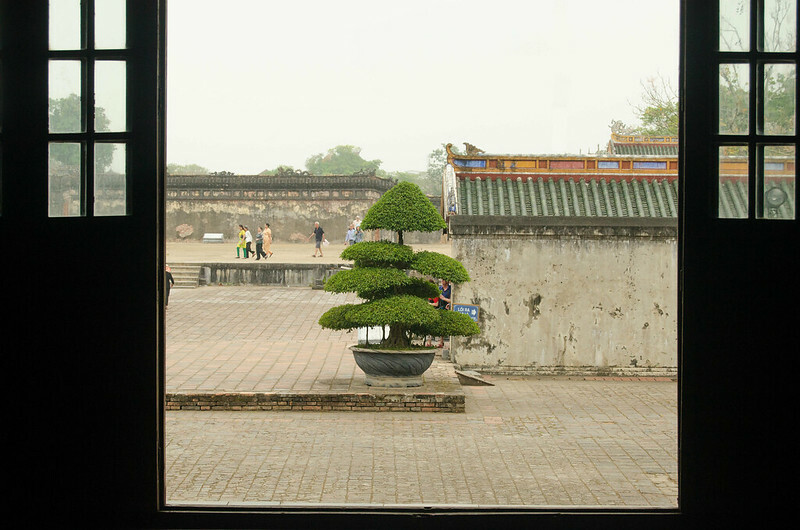 Oddly enough, we were told that if we wanted to eat at a restaurant outside the imperial city, we had to buy a new ticket to get in. 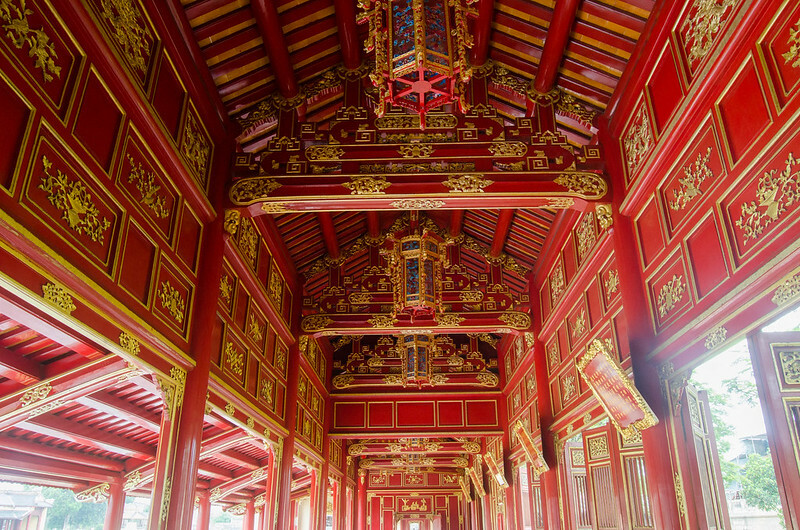 In the afternoon we visited the ruins of the Forbidden Purple City and the Emperor’s Reading room. 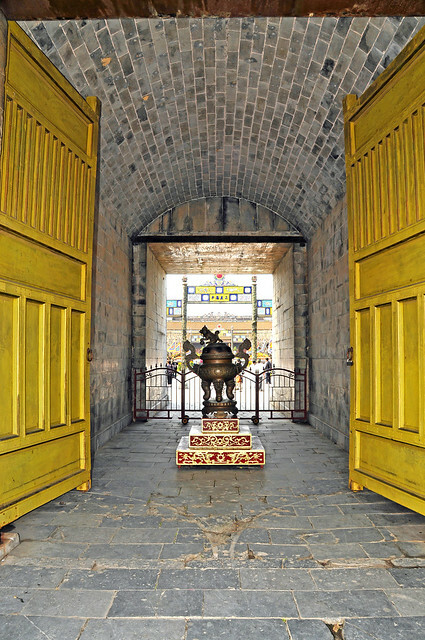 The Forbidden Purple City is like a citadel within a citadel, where only the Emperor, his family, his concubines, and eunuchs lived. 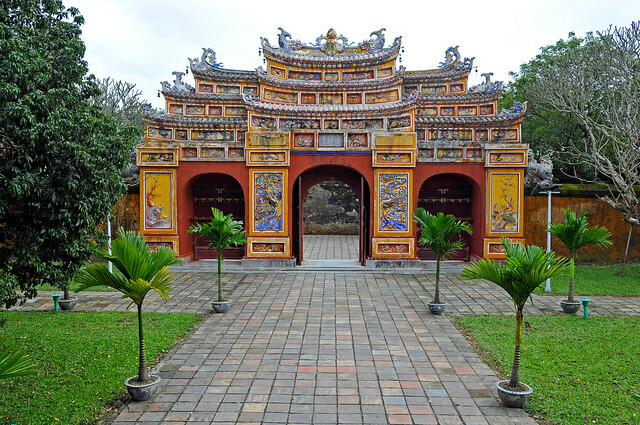 The entire complex is enormous and well-gardened for the most part. 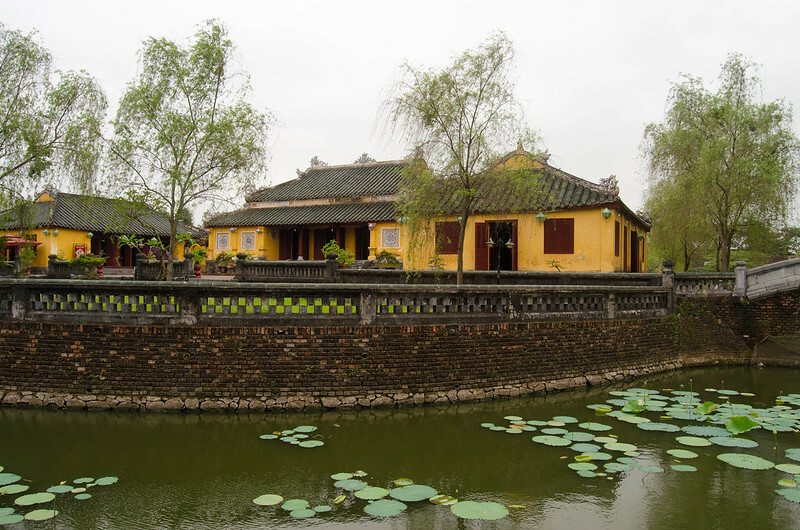 The restored buildings encompassed by ponds, trees, and singing birds create a calm environment where you can walk calmly for hours ̶ and forget the intense fighting that happened there just a few decades ago. 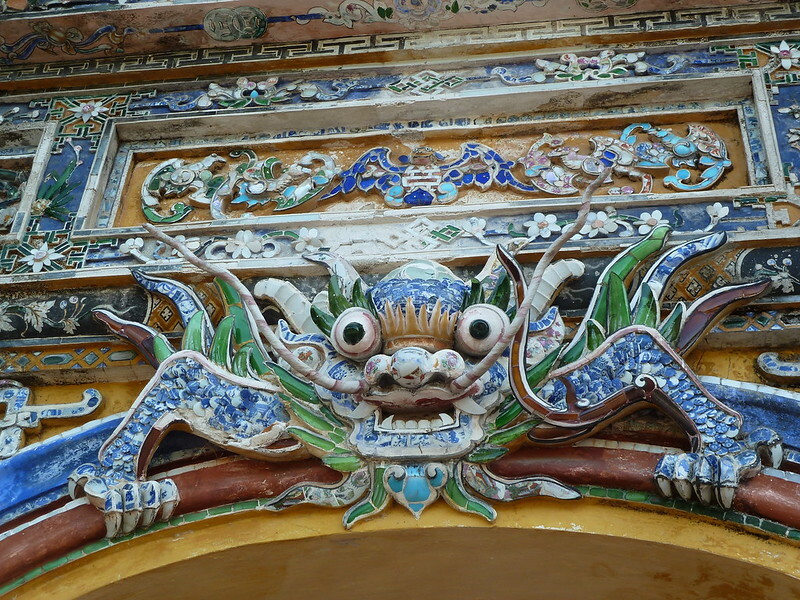 Ceramic and glass dragons are a constant decorative element throughout the architecture, as they are symbols of the monarchy. At the end of the visit, we had to say goodbye to our Portuguese friends Adriana and Diogo. Coincidently, on our way back to the hotel, we got in a tiny French bakery for an afternoon snack and met a Portuguese girl named Ana. The conversation flowed for hours. 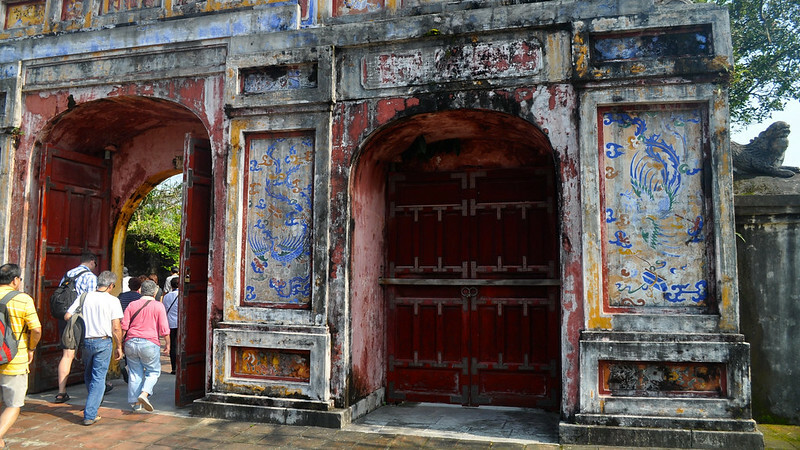 Living in Hue for a year and a half, she’d never met other Portuguese people in the city. 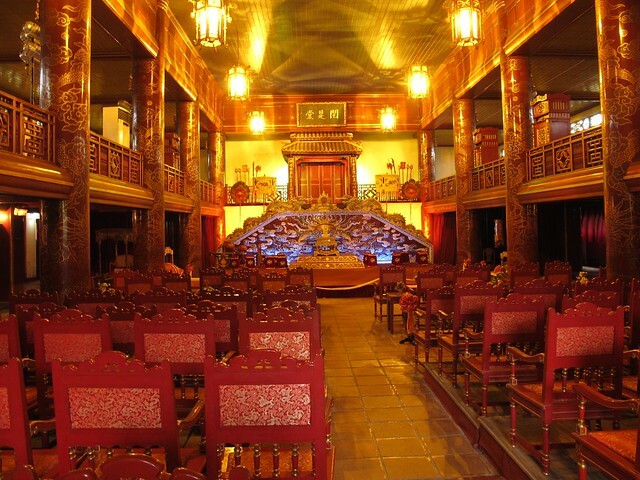 With so much of Vietnam still to see and our Visa expiration date getting closer, we had to move on from Hue to our next destination: Hanoi. If you have any questions or some extra info to share, please leave it in the comments below. Thank you! Hi there! We’re Nuno and Mário and we share helpful tips to make travel planning easy for you. For more travel blogs, join us on Facebook! I was at the Imperial Palace but my photos aren’t good due to the overcast sky. Looking forward to your posts! Nothing that a little bit of Adobe Lightroom can’t fix. 😉 You should try it. Join us on the web for all the travel goodness! Do us a favor and click “Agree”? Our website may store or retrieve information through your browser, usually in the form of cookies. Since we respect your right to privacy, you can choose not to permit data collection from certain types of services. However, not allowing these services may impact your experience. We use some videos on our site which are on YouTube. YouTube will send some cookies to know your preferences. We use a plugin which shows you our beautiful Instagram feed. This plugin sends cookies to your browser. We have the Facebook like button in some areas of our website, connecting you with our Facebook profile. This plugin may use some cookies.